Donna McDonald grew up in Southwest Montana and has had the opportunity to spend her entire life in the mountains and streams. Because she’s had the privilege of experiencing the outdoors in ways most people have never dreamed, she has dedicated her life to sharing it with others. 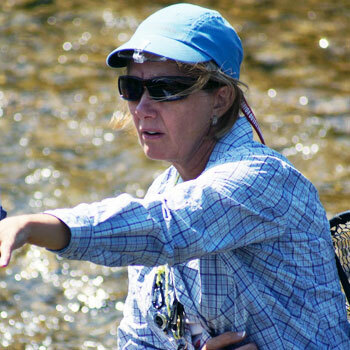 Donna McDonald a professional guide and native of Montana has been actively involved with the reintroduction of grayling into the Ruby River. Join us and learn about this great fishery and fish. Donna has been a licensed outfitter with the state of Montana since 1989. Since then, she and her husband Jake have been the owners and operators of Upper Canyon Outfitters, a well-recognized guest ranch in western Montana, homesteaded in 1910 by her grandfather. Donna’s love of the wilderness began well before the business. Having grown up on the Ruby River, horseback riding and fishing has always been a part of her life. Teaching, guiding, and speaking to groups has given her a platform to share her enthusiasm with others. Donna laughs, “I can’t remember not fishing. But I can remember not fishing well! Donna finds protecting the wildlife, habitat, and natural resources we so enjoy a vital piece in being good stewards to the land. She has been a leader and participant of many wildlife preservation associations and community organizations over the years, including Big Hearts under the Big Sky and Casting for Recovery. She actively participates in developing solutions and legislation that address issues involving hunting, fishing, and outdoor heritage.